Brazil's National Petroleum Agency - ANP - said the Franco Prospect holds recoverable reserves of 4.5 billion barrels of crude, making it one of the most promising wells drilled in the presalt region. In April, the ANP announced that Franco - the first well drilled as part of the government's capitalization plan for state-run energy company Petrobras tested positive for hydrocarbons. The find was made northeast of Petrobras' Iara discovery. ANP President Haroldo Lima said that the well 'appears to be one of the wells with the greatest potential ever drilled in the country.' The ANP said that the well found a column of oil 272 meters thick. The regulator used the same calculations used to establish the recoverable reserves at Petrobras's Tupi field, also in the BM-S-11 block. The regulator is drilling wells in government-held offshore regions that would be used in the complicated capitalization plan for Petrobras. Under the plan, Petrobras will receive the rights to explore and produce 5 billion barrels of crude as part of a government infusion of capital into the company. Petrobras will pay the government fair-market value for the oil in new shares, and minority shareholders will be allowed to accompany the share offer. The ANP, Brazil's main regulator for the country's oil and natural gas industry, hired Petrobras last year to conduct the drilling. 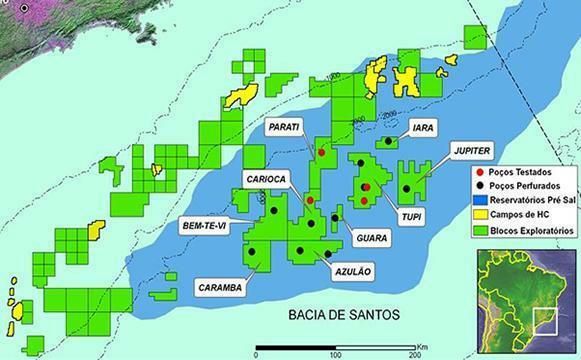 The exploration targets are in Brazil's prospective presalt region in the Santos Basin off the coast of Sao Paulo and Rio de Janeiro states. The oil lies under more than 2,000 meters of water and a further 5,000 meters under sand, rock and a shifting layer of salt. The nearby Iara discovery is estimated to hold recoverable reserves of between 3 billion and 4 billion barrels of oil equivalent, or BOE. Meanwhile, the Tupi field was estimated to hold between 5 billion and 8 billion recoverable BOE. Revealed in November 2007, Tupi was the Western Hemisphere's largest oil discovery in 30 years.